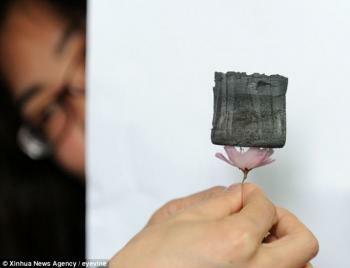 In March 2013, researchers from China's Zhejiang University developed the world's lightest material ever made, Graphene Aerogel, is made from freeze-dried carbon and graphene oxide. Today it was reported that that bit of Graphene Aerogel was sold in an auction in China for 10 million yuan ($1.6 million). Graphene Aerogel was developed by a nanometer-macromolecule research group at Zheijang, led by Professor Gao Chao. The material has excellent properties, and may find usages in areas such as oil-absorbent and organic absorbants. Carbon Aerogel can absorb up to 900 times its own weight.